Picture this, you’ve been saving for the past five years and you finally have enough money for your property deposit, however you are struggling to find a mortgage due to your poor credit score. We tend not to think about our credit score until it’s too late, but it needs to be a priority and something you pay attention to early on in your adult life. So what is a credit score? Your credit score is a number provided by a credit referencing agency (CRA) that ranks how trustworthy you are to creditors. The higher your score, the more trustworthy you are considered therefore resulting in a better chance of obtaining credit. A high credit score can also provide you with preferential interest rates and deals. • Even financing a Rolex! 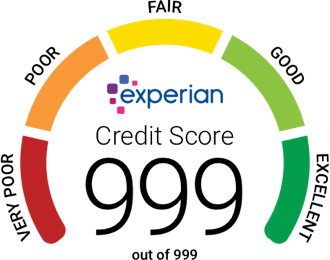 Experian (one of the three U.K. CRAs) provides your credit score on the below handy chart which colour codes your score in segments, from very poor (red) to excellent (dark green). Now the last thing you want is for your credit score to be looking like Darth Vader’s lightsaber, so I will be providing you with quick five tips on how you can improve it. As the saying goes, knowledge is power. You need to know what your credit score is in advance of applying for important credit to give you time to improve it, if needs be. As mentioned above, Experian is one of the U.K’s CRAs and they provide a free service where you can check your credit score. You can even set up email alerts to notify you when your credit score has changed. Head to https://www.moneysavingexpert.com/creditclub to sign up. At the age of 16, I just about knew how to spell the word politics let alone know how or who to vote for, however, in the United Kingdom you can register to vote from the age of 16 (14 in Scotland), despite not being able to vote until 18 years old (16 in Scotland). Registering to vote helps verify your identity and lets potential creditors know that you are not Joanna the Scammer! You can register to vote by clicking here or by heading to the gov.uk website. To most, the mention of the words credit card sounds like a first class ticket to financial suicide; however, this does not need to be the case. Owning a credit card is a great way you build your credit history, especially if you don’t have any yet. You can spend a small amount every month and pay off the balance in full; with this method you will incur no interest or extra fees whilst at the same time boosting your credit score. Using your credit is good, however, you do not want to use too much of what is available to you. Let’s say in total you have £1,000 of credit across all of your accounts and you are using £900 of it. Your credit utilisation will be 90%. This is a red flag to creditors at it shows you are relying too heavily on credit and not able to afford to pay it back.. The ideal credit utilisation should be no more than 30%. There are two ways you can achieve this; either by reducing your spending across all your accounts and/or by increasing your credit limit (speak to your credit provider if you wish to increase your credit limit). With the same example as above, if you were able to increase your total credit limit to £3,600, with the same amount of spending, your credit utilisation will be reduced to just 25%. Whether it’s paying your rent, credit card, or phone bill, it is vital to pay your bills on time. It’s very easy to let this slip by even a day but that is all it takes for creditors to put a literal red mark by your name. A late credit payment will show up when a credit check is run on you. If you are bad with timekeeping or remembering when payments are due, a great way to avoid late payments is to set up a direct debit through your bank. If your credit payment day does not align with the same day you get paid it is worth speaking to your bill provider to see if they are willing to amend the due date accordingly.